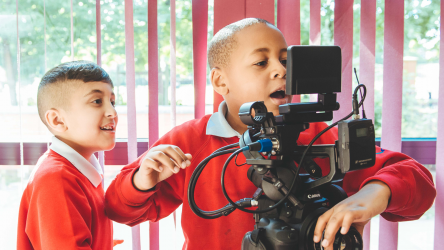 The Into Film Awards are back once more, as we again set out to find the best young filmmakers, reviewers, film clubs and teachers using film in the classroom - this year with the support of media partner Guardian Teacher Network and education partner NATE. The Into Film Awards, taking place on Tuesday 13 March at BFI Southbank in London, is the perfect opportunity to test your creative talents and try your hand at filmmaking in the classroom or as part of your Into Film Club. Whether or not you've tried your hand at filmmaking before, we have a host of hints, tips and resources to help you on your way, from our mini filmmaking guides through to our iPad filmmaking and stop motion animation guides, and many more. Get inspired by checking out all of our filmmaking resources here. All schools, organisations and individuals can enter the Into Film Awards, and the closing date is 31 January 2018. Into Film Awards recognises the talents of many young people throughout Britain and inspires excellence in the creative arts. My advice to any young person interested in filmmaking is find your voice. Have a story to tell and work in a team. You will find out a lot about yourself and what you are good at, and you will learn to appreciate others. There are three filmmaking categories, running across different age groups. Films may be made with professional equipment and cameras or simply shot on a mobile phone. This category honours three young people aged 13 to 19 who have demonstrated exceptional talent and ambition in any aspect of the world of film, be it filmmaking, reviewing, or anything in between. This category recognises and showcases the work done in two exceptional Into Film Clubs. Members and club leaders are invited to nominate their film club. This award recognises innovative uses of film to aid learning. Nominations may be submitted by educators themselves or by a colleague, parent or student, and must include an example of work demonstrating how they've used film to impact positively on young people's academic or social development - be that via the screening of interesting films, filmmaking, review writing or other film-related activities. This award celebrates outstanding reviews written by both Primary and Secondary students; those that stood out among the thousands of reviews uploaded to our website every week. This category invites young people to vote for their favourite family film of the year. Previous winners have included Maleficent, Star Wars: The Force Awakens, and Miss Peregrine's Home for Peculiar Children. Winners will receive the coveted gong at the Into Film Awards ceremony, a star-studded, red carpet event to be held in March 2018 in central London. Enter today and you could be one of them! Find all about the Into Film Awards, our star-studded celebration of young filmmaking talent, inspirational teachers, incredible Into Film Clubs and new talent to watch. 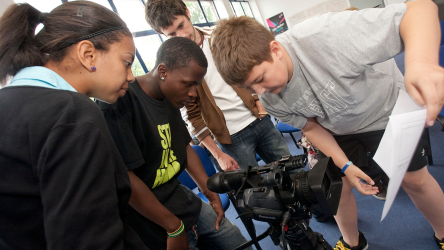 Introducing filmmaking as an activity is a great way to instil a deeper engagement with film in your members. A session to build educator confidence in filmmaking outside of the school curriculum.